We’re going to make an educated guess here–keeping your business thriving is probably a top priority, right? Well, collecting sales leads using your Wufoo form is just the first step to make sure you stay #1. Next? Follow up and convert the prospect into a customer. Using a sales CRM to keep track of your sales leads can dramatically increase your team’s chances of converting a prospect into a customer. Win-win for everyone! ClinchPad is a modern CRM system which unlike traditional CRM software focuses on deals rather than contacts. 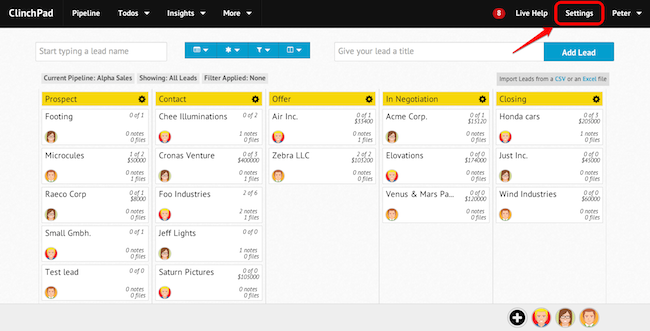 Our main focus is on managing your sales pipeline through an intuitive visual interface. We target small teams looking for simple solutions for managing their business leads over large-scale sales teams. ClinchPad is free to use for tracking up to 100 leads and our pricing is super economical to boot. Entering data into a CRM system is tedious and often a significant barrier to CRM adoption. ClinchPad eliminates the need to re-enter data captured in Wufoo forms. Instead, you can automatically convert them into leads in ClinchPad. 1. 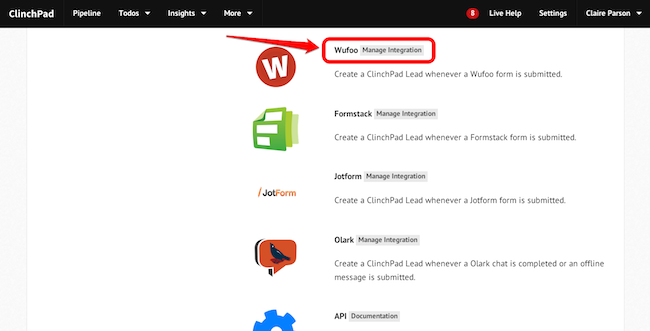 To get started with integrating Wufoo with ClinchPad, click on Settings from the top menu. 2. 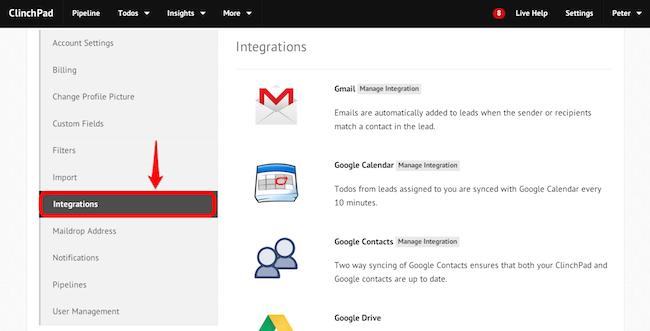 Select Integrations from the left menu. 3. Scroll down until you find Wufoo and click on Manage Integration. 4. Click on Integrate New Form. 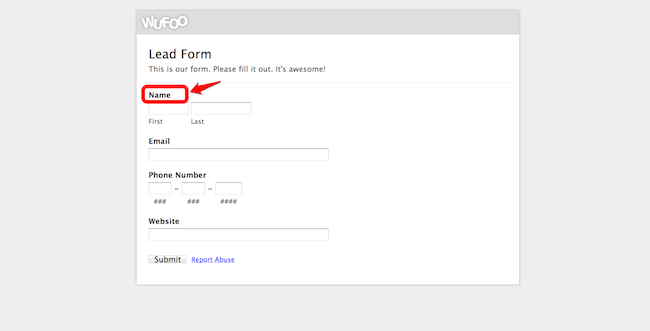 Fill in the Form Name exactly as it appears in Wufoo in the popup that appears. A Wufoo label Name is shown, circled. If you’d like whatever is entered in this Wufoo field to be the Lead Name in ClinchPad, enter the label Name in the Lead Name textbox. 5. Similarly, do the same for Contacts, Products, Zones and Sources if applicable and select a Pipeline and Stage where the Lead should be created in. 6. After you create a form, use the highlighted URL and handshake key when you create a Webhook in Wufoo. You can find a guide to creating webhooks in Wufoo here. Once done, you should see leads being created in ClinchPad whenever your Wufoo form is submitted. There you have it–clinch that top spot thanks to our sweet integration. Cheenu Madan is the founder of ClinchPad. When not working on his startup, he’s usually either playing soccer or wolfing down large quantities of pizza. Posted May 21st, 2014 by Praveen. Nice integration. Looks like a nice tool for client leads and the low-cost will be good for some of my clients. Posted May 21st, 2014 by Rich. I’ve been trying to integrate this with the instructions provided, and all I get are 400 errors, no matter what I do. Posted May 21st, 2014 by Kat. I’m confused. Can I not integrate an existing form? Posted May 21st, 2014 by Michael Z Rork. Can you email us at support@clinchpad.com and we’ll take a look? Thanks! Posted May 21st, 2014 by Cheenu. In case you run into any problems, you can email us at support@clinchpad.com and we’ll be happy to help!